Today, I just passed my final road test and I can't hide my happiness. It took me almost a year just to finish this course. Anyway, the major reason why it took me that long is that I always travel due to work and everytime I leave, I have to stop my classes. And when I return from my trip, I have to wait for another slot and instructor. Also, my initial classes were only on Fridays so I really wasted a lot of time. So if you want to get your license faster, make it twice a week and don't leave the country at all. Registration. You can go to any offices or outlets that are available for your school (mine was Belhasa Driving Center in Al Quoz). You have to bring all the required documents upon registration. Click here to see the list of documents that you need to bring. Theory Classes. Next is to attend the theory/lecture classes. It is like a classroom but the number of students is superb (at least 70 students in one room!). You have to complete 8 classes and you have an option to finish it all in 1 day. It will require 8 hours. What I did was I took classes 1-4 in one Saturday (8AM to 12PM) and classes 5-8 in another Saturday (1PM to 5PM). You can see the lecture schedule on this link (I took mine in Al Wasl). Pass the Theory Exam. After the theory classes, you should set a schedule on when you want to take the theory test. The exam will be time limited to 40 minutes. You have to get at least 23 correct answers out of 35 questions. There is an RTA mobile app where it has some useful and sample questionnaires of the exam. Schedule Your Classes. After passing the theory test, you may now start your practical classes. You will be given 3 options. (1) Regular classes: you can have Sunday/Wednesday or Monday/Thursday or Tuesday/Saturday. (2) Fridays only (3) VIP/Shifting: you can schedule any day (except Friday) and any time you want but you should set your appointment in the reception and can only be cancelled within 24 hours [this option is the most expensive]. Pass the Signal Test. After several practical classes, your instructor might ask you to take the parking test on which your ability to park properly is being assessed. Your instructor will give you 2 to 4 lessons for this. Just remember all the pointers that they will give you. You just need to remember the turning points for each type of parking. Pass the Assessment Test. This test is like the final road test but being supervised by the driving school examiner. It will only take 8 to 15 minutes and you just need to relax. Show the examiner that you are turning your head during lane change and that you are very observant of the road. You just need to drive around the area near your school to test your left and right turn capabilities. Final Road Test. This will be handled by the RTA and will be the same as assessment road. You can have 12 minor faults to pass but 1 immediate fail (major error) will require you to retake the test. During this test, just do the same thing with your assessment test. But this time, the examiner might be tricky and will ask you to change lane under the signal or park in a no-parking zone. You just need to focus and again, relax. Freeway classes can be taken before or after the final road test. After you have completed the seven procedures, clear your accounts and go to the main office to get your license. I didn't discuss the amount and the total expenses as it might discourage you (yes, it is not cheap to get a license here). 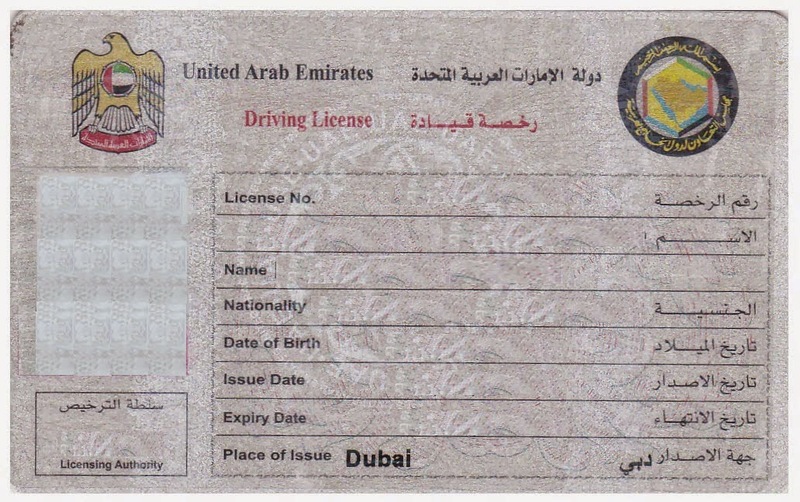 One has to get a complete training before applying for a driving license in UAE, as it will help in making no mistakes and get the license approved easily.